Each year in Australia, millions of people who need legal help don’t get it. They may be unable to afford it, or not know how to find it, or even that their problem has a legal solution in the first place. The community and pro bono legal sectors do what they can, but there is more need for legal help than there are lawyers to provide it. How do you increase the impact of legal services when there simply aren’t enough lawyers available who understand and can diagnose, triage and address people’s legal needs? That’s the challenge our Gateway Project is about to solve. Our vision is a user-centred legal system. One where connecting with the right help is straightforward, and where understanding services and linking with pro bono is quick and easy. Pro bono lawyers should also be able to find and express interest in opportunities that match their skills just as easily. We’ve created a vision for a better system alongside the people who use the system. Now it’s coming to life through our Gateway Project. 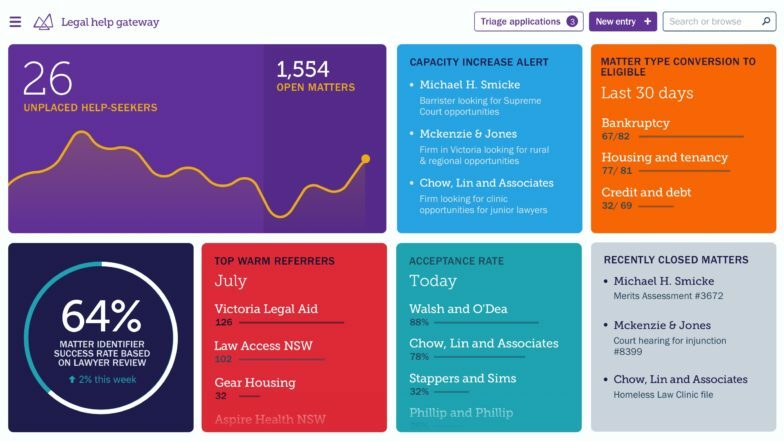 We’ve just released our first Gateway product — an online tool that helps people understand our services and apply for legal help. The tool lets them make a full application — including uploading documents — all from their computer or smart-phone. Our specialist team then evaluates and connects people in need of help to Justice Connect’s legal services and network of 10,000 pro bono lawyers. Phone application options are still available. Already, our intake tool is having a positive impact on people’s lives. One 77-year-old grandma recently completed an application for help at 1am, too stressed about her legal problem to sleep. We’ve connected her with legal help. Others have applied while experiencing homelessness and living in their cars, from their smartphones. We’re ensuring people can apply for legal help on their own terms, in their own time. Our soft launch has also proved that processing applications doesn’t have to take hours — when a help-seeker starts their application online, it saves around 20 minutes of time for our staff and for help-seekers. This is just the first stage of the Gateway Project. Soon, we’ll launch tools to guide our sector colleagues through making warm-referrals to our various services, and a pro bono portal where lawyers can update us on what work they want to do, and browse for relevant pro bono opportunities too. Getting to this stage in our project has taken a significant collective effort, and we’ve had investment of time and finances from many supporters, colleagues and people that we work to help. Our Gateway project started with seed funding from Google.org, and we’ve since secured significant support from a range of philanthropic foundations, the Victorian Government and our member law firms. In particular, we’d like to thank Google.org, Perpetual Ltd, The Myer Foundation, The Victorian Department of Justice and Regulation, DLA Piper and Hive Legal.